I am totally enjoying the Micro-Feathers. (I'll be ordering the Mini and the "regular" feathers templates shortly.) I am completely addicted to this tool. 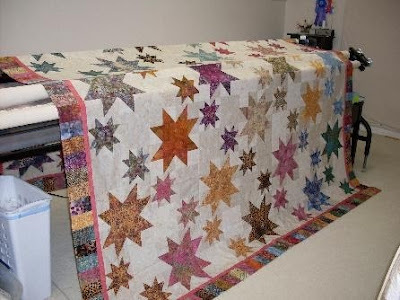 The CL is a wonderful help in my quilting. 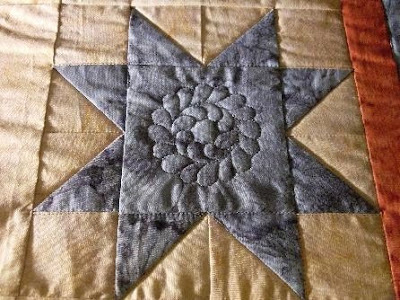 I realized today that I could sew for 4 hours and leave the quilt studio without aches or soreness! Up front doing custom can leave me with tired neck, shoulders and even strained eyes. A full day of doing pantos can leave me achy sometimes too. The CL is almost effortless. Perhaps more block motifs are in the Micro-future! It is most amazing to me that this is the first time I am using the CL, and the first time with this template, and the feathers are beautiful. Short learning curve...just have to pick a consistent "path", and be sure I travel down far enough so it does not look choppy. 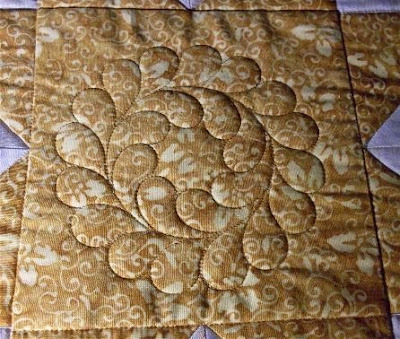 The feathers are a beautiful shape and very attractive when sewn.They are fast, easy and make the quilter look really talented! I am more than half done with the feathers. With luck, I'll be on to the background fill by Thursday. It is a big quilt 110 by 122. It will take a while before it is off the frame. I'll get good pix eventually! Thank you so much for making me look really good at feathers! 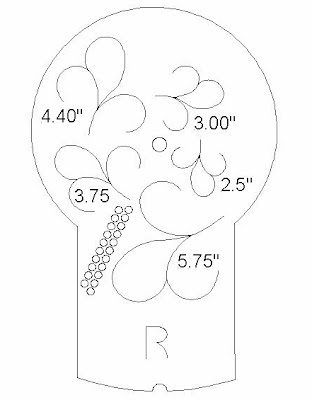 Lisa Burghart needed a feathers template to do tiny feather wreaths. Here is the template, she asked for. You'll have to wait for her to show the finished quilt. 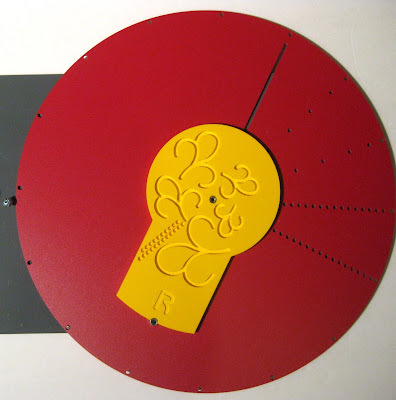 The Micro-Featherz template sits on the Stepping Disk. The pattern is made in the same manner, as the larger Mini-Featherz, Featherz, and Large Featherz, by stepping around 8 times. You don't even have to stop the machine, or lift the stylus, just work in the Needle Down position. 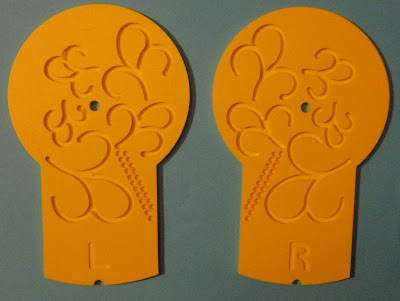 The Micro-Featherz come in a set of Left and Right templates. 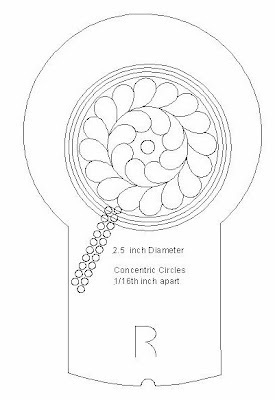 Below are drawings of the smallest 2.5" pattern surrounded by concentric circles. 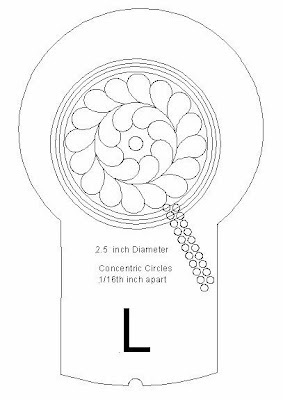 Circles are 1/16th inch apart. 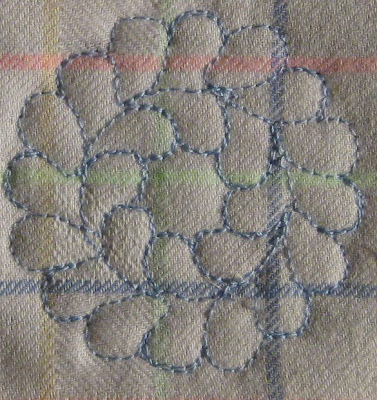 Below is the 2.5 inch pattern stitched out. The feathers are so small it is hard to get a puffy without Hi-loft batting.